What a performance today by Petra Kvitova! I mean. yes, we predicted she would win before the start of the fortnight, but she truly impressed us in her 6-3, 6-4, 85 minute romp to the Wimbledon title over 5th seed Maria Sharapova. We expected Kvitova to survive a quarter holding Vera Zvonareva, a reeling Jelena Jankovic and a rusty Venus Williams, but we weren't expecting Sharapova to be across the net in the final. The Siberian siren cuts an intimidating figure, and not just for tongue-tied guys. Her booming serve and never-say-die attitude have scorched many an opponent far more accomplished than the 21 year old she would face this morning. Still, we were convinced Kvitova would win and so was she. The dominant criticism of the latest generation of WTA starlets is that a diluted version of the Anna Kournikova gene has spread to much of the younger generation of WTA. The players are beautiful, they are brands, they hit hard and they're good, but they have a helluva time trying to win when it counts. For evidence, see the Wikipedia entries for Jankovic, Zvonareva, World No. 1 Caroline Wozniacki. To be clear, each of these women has accomplished far more on the court (and far less off of it) than Kournikova, but their relative futility on the biggest stages of the game is comparable. The reason there was so much excitement about the return of Serena Williams is that in the year since she left, no one has consistently played with a winner's mentality. That's what we love about Sharapova, she has the mental steel, even though her game has recently been broken. That's the reason we couldn't pick Sharapova to win and the reason she ultimately didn't, though improving, her game is not as strong as her desire these days. Today, though, is about Petra Kvitova. She didn't sit idly by, filing her nails, waiting for the Russian to collapse. She took it to Sharapova in the same way Sharapova did to Serena Williams all those years ago. Sharapova's serve was spotty today, but it wasn't nearly the abject disaster I feared it could have been. She actually served 76% with six double faults, half of what she posted in her semifinal against Sabine Lisicki. Both players service speeds were nearly identical. The difference was that Kvitova was able to use her big serve out wide to get the 6'2" Russian on the run, forcing the action and leaving herself an open court to hit into. The stat of the match is that Kvitova won 72% of her first service points, Sharapova, just 58%. Kvitova gave Sharapova no quarter, her groundstrokes were powerful and precise and importantly, never broke down. The real story of Kvitova's win is that she didn't collapse, nor did she wait for one. In her very first major final, she played precisely the kind of aggressive tennis we've become accustomed to from Serena, pre-surgery Sharapova, Kim Clijsters when she shows up and precisely no one else. It's the reason those women win majors, it's the reason Wozniacki, Zvonareva and Jankovic, among others, haven't. Skill and fitness mean a lot to a pro athlete, but when you combine that with a healthy helping of guts, you've got the makings of a champion. Kvitova is the first player of her generation that I predict will be more than a one major wonder. After her win, Kvitova said "I like the big matches and I like playing the finals." It showed, Petra, and we think you'll have plenty more to enjoy in the coming years. Congratulations. So what does this mean for Caroline Wozniacki? Well, it was bad enough to have the international press corps and blogosphere questioning your legitimacy. Frankly, who would blame her if she used her Yonex to give a good crack to the rankings computer the next time she visits the WTA offices? Now, thanks to Kvitova's steely display on the biggest stage in tennis, Centre Court, Wimbledon, Wozniacki's no longer the leading light of her generation. Caroline Wozniacki has been No. 1 for 38 weeks and famously hasn't been able to bag a major title. The good news until today was that she doing well for her age. An overachiever in her peer group (players aged 18-22), Wozniacki had built a solid resume of wins everywhere but majors. In terms of quantity, she's still the WTA's clubhouse leader with five titles this year including the big (Premier Mandatory) events in Dubai and Indian Wells this year. However, her hall pass expired today. Kvitova's win throws down the gauntlet for the jovial Dane. While I'm sure the Woz will congratulate Petra on Twitter and maybe even have a celebratory dinner with her, things just got real in the Wozniacki camp. For the first time a player of her generation has surpassed her high water mark. How will she react? The US Open Series just got a little more interesting. Fully admit it, Blacklabel Tennis has a major case of singles bias. I've always found myself drawn to the sport as an individual pursuit and rarely watch doubles competition. That said, I always make a point to acknowledge greatness. Today, Mike and Bob Bryan played their 19th major final at Wimbledon. Coming in, their major career stats exactly mirrored what Rafael Nadal has been able to accomplish in singles: ten major titles and 19 ATP Masters Series crowns; that's obviously pretty special stuff. Specifically, today's match was significant because it allowed them to lay claim to GOAT (Greatest of All Time) status among doubles teams. Their second Wimbledon crown squares them with Aussie legends Mark Woodforde and Todd Woodbridge with a record 11 majors as a team. It is also their record 73rd overall title, that's six more than Roger Federer. Again, that's pretty special stuff. Maybe American tennis isn't dead, it's just become a team sport. Even young guns John Isner and Sam Querrey seem most comfortable on the doubles court. 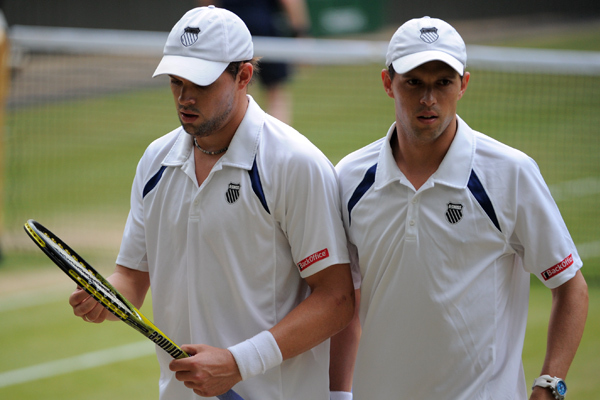 By that measure, the Bryans are not only arguably the greatest doubles team of all time, but the greatest American players of their era. Kvitova was hilarious when she won. No BS with this girl. Loved her pop's reaction too. She's a great talent and I hope she continues to evolve.